I just returned from a four day river trip down Desolation Canyon, it’s a sunny fall day, and we’re talking about huevos rancheros. All some of my favorite things. Life is good. I like savory more than sweet for breakfast. Like I’d rather eat french toast with strawberries and syrup for dinner than for breakfast. 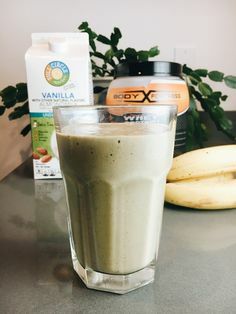 I feel better when I get some protein and veggies in the AM and I feel more satisfied. When I lived in Korea we ate rice, kimchee soup, and seaweed paper for breakfast most mornings. I loved it. Breakfast was salty and spicy and satisfying. And that’s why I absolutely adore this breakfast. It’s probably my favorite. 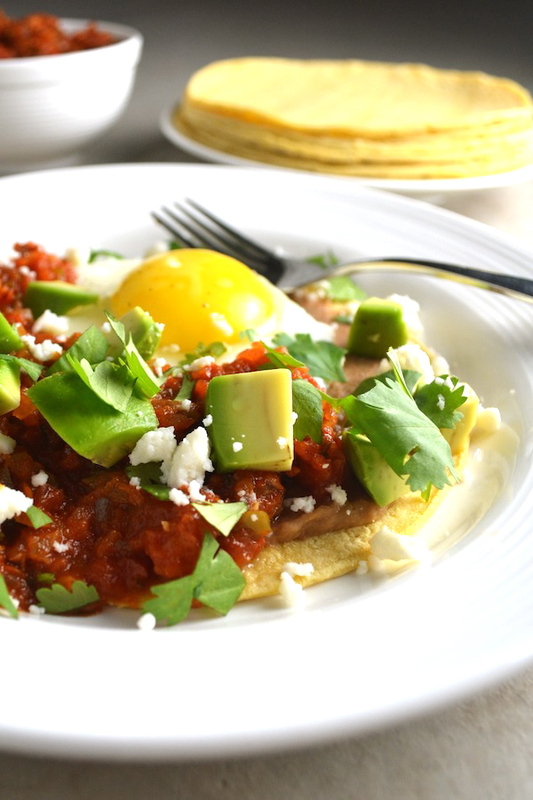 Beans, eggs, tomatoes, avocado, queso fresco…I mean, yum. 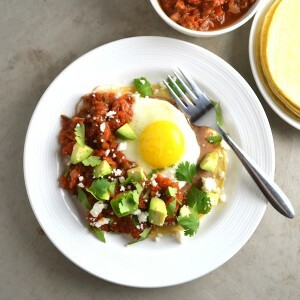 I adapted this recipe from Jamie’s Huevos Rancheros that I found on the Food Network. I like the Kirkland organic tomatoes you can buy at Costco or on Amazon, Amy’s organic refried beans, Redmond Real Salt, and Fatworks pure pork lard. As for corn tortillas, I still buy mine. I like La Tortilla Factory handmade style corn tortillas, but they have some ingredients in them that aren’t the best. Do you know of a store bought brand that’s really good? I’d like to start making my own. I just need to get around to it. Have you seen these cool cast iron tortilla presses? They make making your own corn tortillas really easy I guess. 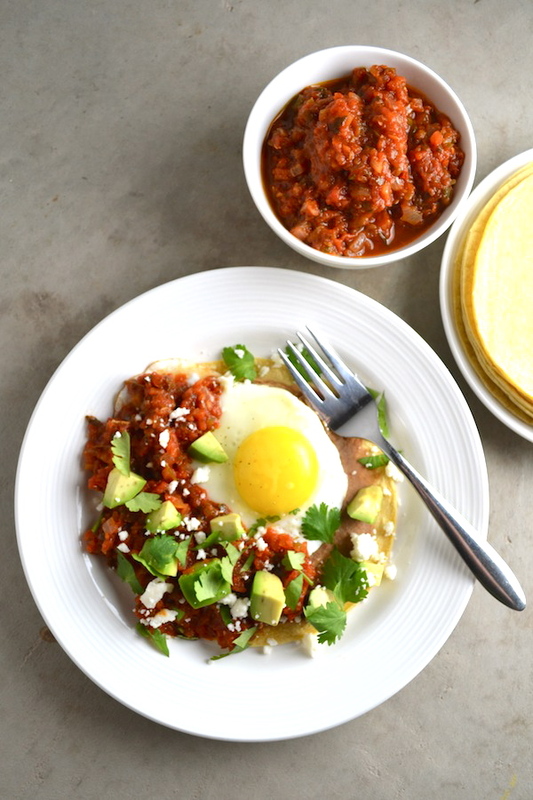 I hope you enjoy these huevos rancheros. 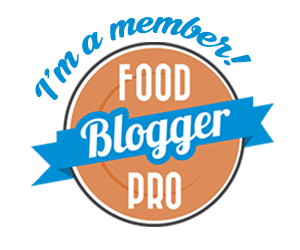 Hear hear to real food for breakfast! In a large pan, heat the olive oil over low heat. Add the onions and saute until soft. Add the garlic and cook until just starting to brown, about 1 minute. Put the onion and garlic in a blender. Add the diced tomatoes, diced jalapeno, cilantro, and salt to the blender. Pour the mixture back into the pan and simmer over medium heat until thickened, about 10 minutes. While the sauce is cooking, heat the refried beans in a saucepan. In a separate skillet, heat a tsp of olive oil or lard over medium heat and place a tortilla in the oil. Cook until golden, but not crisp, about 30 seconds. Flip and cook for another 30 seconds. Transfer to a plate. Continue until all the tortillas are heated. Cover to keep warm. In the same skillet, fry the eggs sunny side up or over easy, one at a time. Place the tortillas on separate plates, spread refried beans on each tortilla, put a fried egg on top of the beans, pour the tomato sauce over the egg, and then top with avocado, queso fresco, cilantro, and sour cream.